Harvest Festival and Blessing of the new Altar Rail! Young Ambrose has had GREAT fun this year growing his own pumpkins! He has brought three of his best along and is showing this one off to you all! 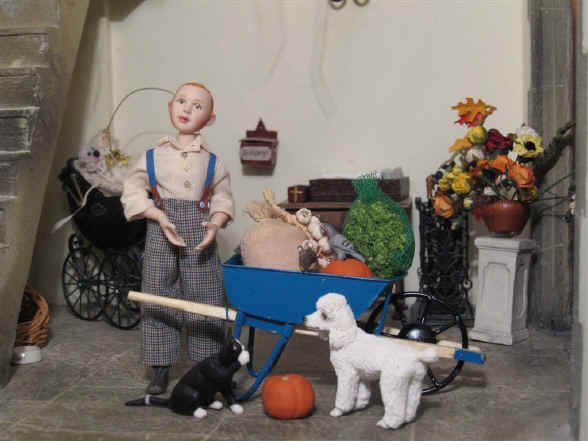 ....oh dear who have we got here IN the wheelbarrow? It is no less than young Syd the pigeon and Sepp the rat! They must have decided to hitch a ride in Ambrose' wheelbarrow! Sepp is even being very naughty and, with Syd encouraging her, is trying to push one of the pumpkins that Ambrose has just put back in the barrow OUT again! Tinker the black and white cat has joined in the fun and is annoying Ambrose by tugging at his trousers! Belle, Tinker's best friend, is just letting Tinker get away with it without telling her that Ambrose doesn't like her doing that! Sepp gave that poor pumpkin one last VERY hard push and it fell to the ground! 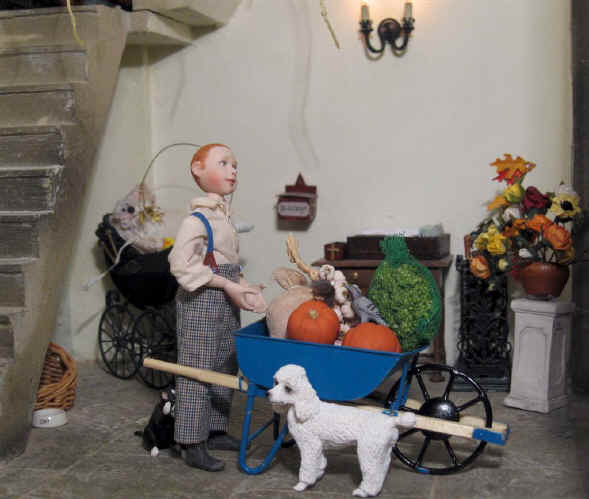 Tinker decided she would investigate the pumpkin instead of tugging poor Ambrose' trousers after he studiously ignored her.........thus spoiling ALL her fun! Tom has brought some home picked mushrooms for Harvest Festival. Adele is admiring the big bowl of blackberries that Megan has brought from home! She better NOT drop it though! The church pets and wildlife really ARE being very naughty today aren't they? If you look closely here you will notice that one of the church mice has decided to help himself to some blackberries that poor Megan had spent ages picking the day before! As you can see she is NOT very happy about this at all! The vicar has called the children and congregation into the chancel at the beginning of the Harvest Festival service as he wants them all to see him bless the lovely new altar rail for service in St. Hilary's Church. 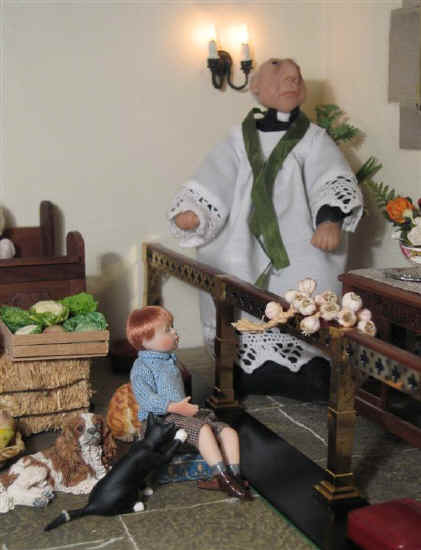 Robert Alexander thought it was a very good idea to take the string of garlic that Ambrose brought on the wheelbarrow and use it to help the vicar bless the altar rail! The vicar was not too pleased with Robert Alexander and ordered him to take it OFF again as it would make the altar rail smell of garlic for a very long time otherwise! Robert Alexander very quickly became "bored" after what he thought was "an exciting idea" was rejected by the vicar. He decided to have a little sulk by way of response and soon dropped off to sleep leaning on the new altar! Tinker tries, but fails, to wake him up. Good try Tinker! The vicar is very wise and he decided it was a much better idea to ignore Robert Alexander and let him sleep on rather than draw further attention to him. 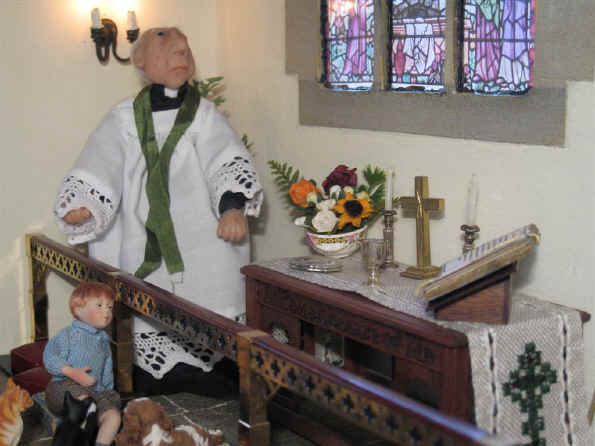 So the vicar happily continued and blessed the new altar rail anyway. 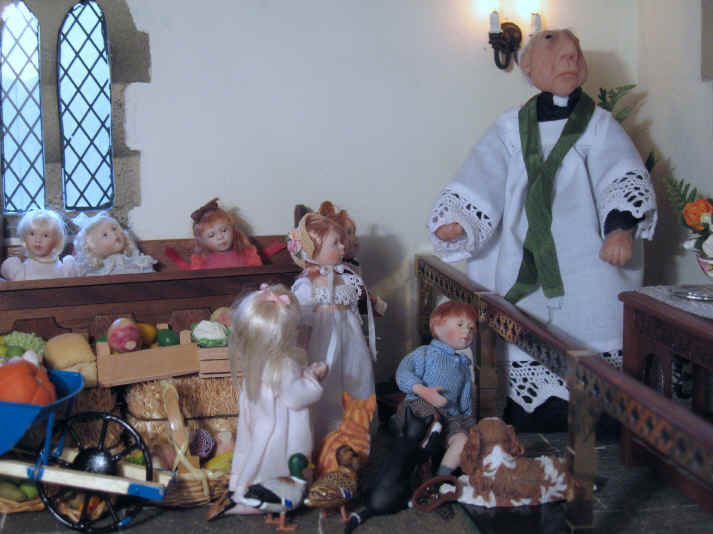 All the other children were most happy to stand or sit to watch the vicar bless the new altar rail. Even Esme and Ernest, the local pair of mallard ducks, had been invited to attend! 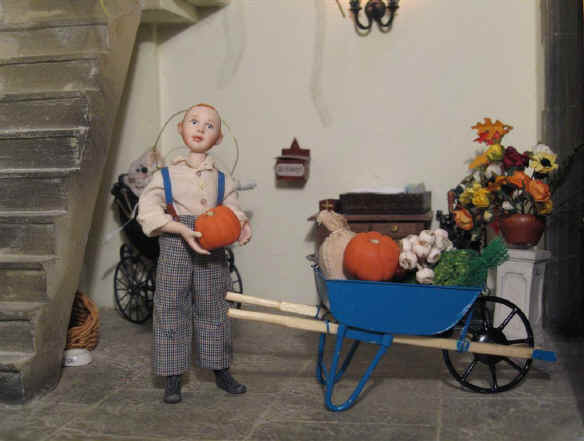 Ambrose even wheeled his wheelbarrow into the chancel to show his pumpkins off to everyone! He is VERY proud of them. 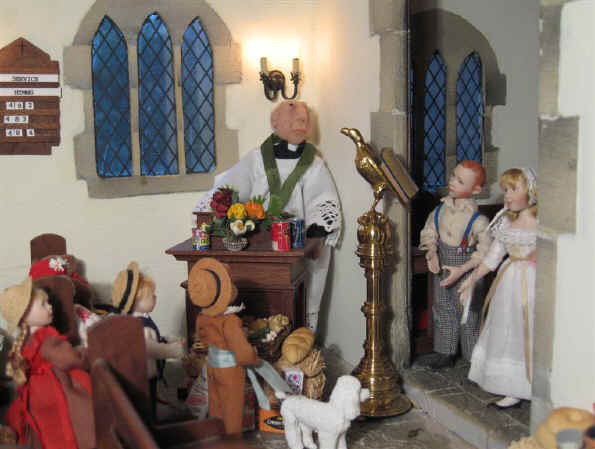 The vicar preached a special Harvest Festival sermon. In it he told them all about the origin of the Harvest Festival service. 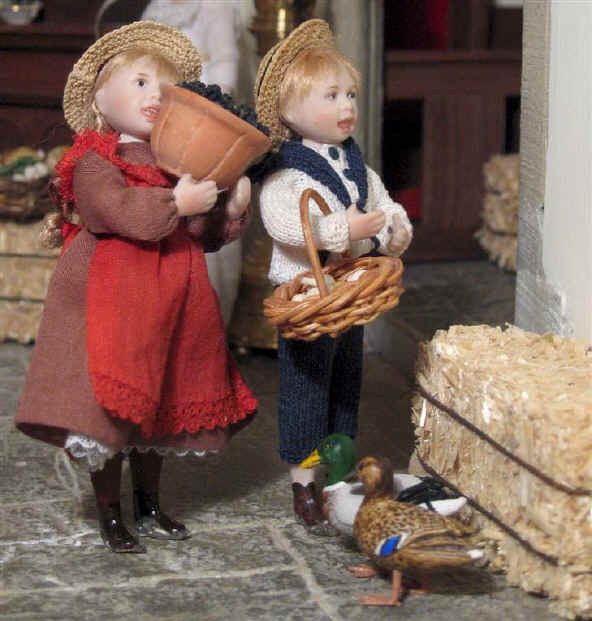 He explained that the very first Harvest Festival service was celebrated back in Victorian times by Reverend Robert Stephen Hawker, vicar of Morwenstow on the coast of Cornwall, in 1843. 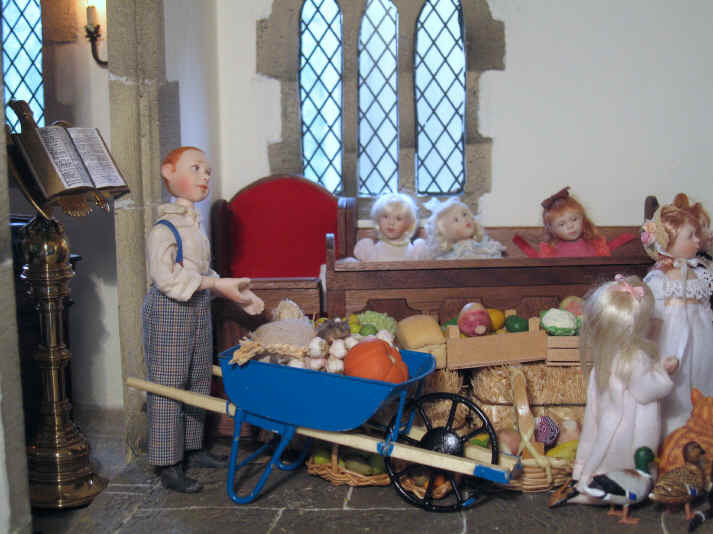 Reverend Hawker had decided to hold a service in which everyone was invited and also asked to bring their produce along as a way to say thank you to God for it. And so the tradition of the Harvest Festival and supper, where everyone met together at harvest time for a meal, was born. The children were fascinated to hear the story! 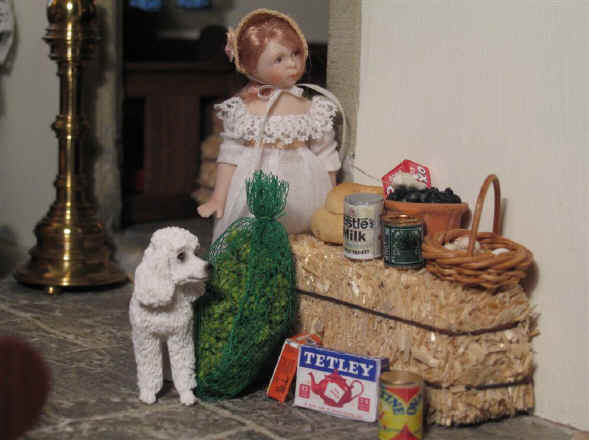 All of the fruit and vegetables (apart from the bag of brussel sprouts and bread) have been provided by Catherine Davies, sister of myself, Sarah Price, of www.dollshouseheaven.co.uk.